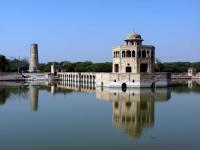 Hiran Minar and Tank, Sheikhupura is part of the Tentative list of Pakistan in order to qualify for inclusion in the World Heritage List. On 4 Feb 2009 Pakistan awoke from several years of inactivity and submitted a nomination for the “Hiran Minar and Tank”. Unfortunately it was just 4 days late against the deadline for consideration at the 2010 WHC. Never mind – it would surely be ok for the 2011! Oh no, it wouldn’t! The 2010 WHC papers record that it was also to be excluded from consideration at the 2011 WHC for being “Incomplete”. And what of the 2011 WHC (for 2012) or thereafter? To date no further mention of the nomination has emerged. We were determined to see the numerous sites around Lahore on Pakistan’s T List and presumed that this site would exhibit something “special” to justify being chosen for nomination even if the final bureaucracy had proven too great a hurdle. Unfortunately the entrance to the tower was blocked by a pile of thorns deliberately placed there, presumably to prevent any animals from venturing inside as well as any visitors! It generally looked dilapidated as we walked around the base. The lake was blocked off to the flocks of sheep and goats which munched around it by similar piles of bushes at each opening in the surrounding wall. At the lakeside itself a few pedalo boats floated waiting for some customers to take them out – but no one did. The overall effect of the pavilion/bridge/tower and lake certainly possessed some charm but, how on earth could Pakistan think that this site was ready for nomination? And why should anyone think that, on its own, this minor Mughal monument might have OUV. It is conceivable, I guess that it could just succeed, if well presented and managed, as a small part of a larger serial nomination covering the Mughal architecture of Jahangir – including his tomb. I have been unable to find on the Web any part of an incomplete nomination file or anything related to Management Plans or other formal assessments of the place. I did, however, find this report in a weekly Islamabad magazine which deplores the run down state of the site, refers to its UNESCO ambitions and quotes an unnamed official as blaming the Ministry, stating that the 700k Pak rupees (A mere US$6000 - which is peanuts even in Pakistan and would probably be inadequate to persuade a corrupt Pakistani politican to turn over in bed!! ), earmarked to “conserve” the Hiran had been diverted to repair Rohtas! But it also mentions the lack of management plans – see http://weeklypulse.org/details.aspx?contentID=2383&storylist=4 . Since the nomination, Pakistan has devolved responsibility for cultural matters to its Provinces whilst maintaining a small central unit to deal with international matters such as UNESCO relationships. The implementation of this change appears, from press reports and from what we saw/heard on the ground, at least initially to have created confusion and lack of control at all levels as Provinces and Centre fight out battles on budgets, and skills (such as they are) get transferred to/developed in the Provinces. Unfortunately this sort of narrative is just too common in relation to the heritage of many of the World’s developing/failing/struggling countries.